Project MARCH is the student team of the Delft University of Technology that is developing an innovative and versatile exoskeleton, which is a motorized robotic armor, that can be used to let people with a spinal cord injury stand up and walk again. At this moment, the biomedical technology regarding exoskeletons is underdeveloped, so that people with paralyzed or malfunctioning legs are wheelchair bound for the rest of their lives. 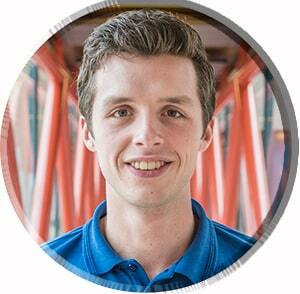 Project MARCH wants a change! The vision of Project MARCH is to give back full mobility to physically disabled people who have a paralyzed lower body due to illness or an accident causing them to be dependent on a wheelchair for the rest of their lives along with all of its inconveniences. Simple daily activities such as buying groceries, climbing stairs or using the restroom are often challenging or even impossible. By giving back full freedom of movement, the paraplegic experiences not only the practical and psychological benefits of autonomy. One day exoskeleton users will be able to go virtually anywhere, and communicate at eye-level with friends and family once again, rather than constantly being “looked down.” Additionally, the paraplegic’s health condition improves significantly by using an exoskeleton. For example, their bones and muscles become stronger, the risk of thrombosis decreases, the bowel function improves, and they experience less pain in their back. The dependency on care providers and insurers decreases. 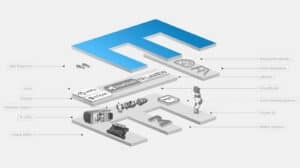 Although Project MARCH is currently only focusing on people with a spinal cord injury, our project could be further extended in the future to patients that suffer from MS, ALS, or people who have had a work accident. 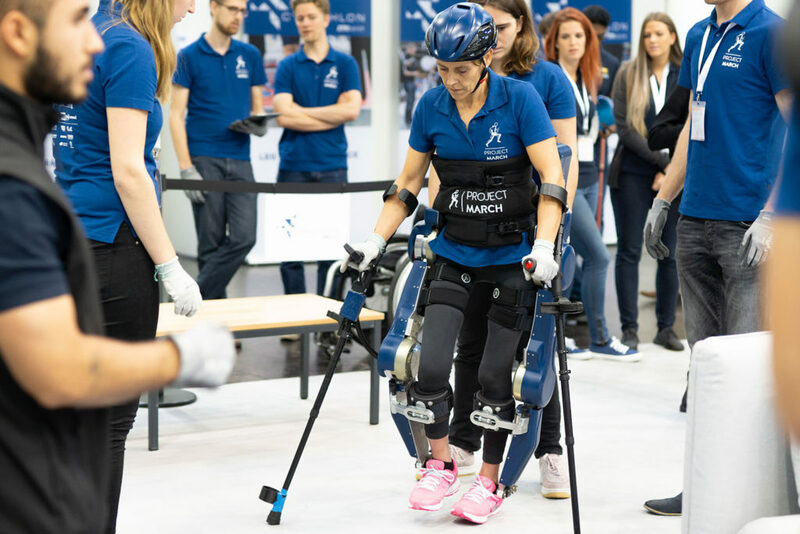 The main goal of Project MARCH is to design and build an exoskeleton for paraplegics that can win the Cybathlon by completing all six obstacles within ten minutes without causing discomfort for the user. The Cybathlon is a competition for bionic para-athletes where commercial and academic teams compete with an exoskeleton to complete the six obstacles of the competition as quickly as possible. These obstacles are designed as imitations of daily-life challenges for wheelchair users. 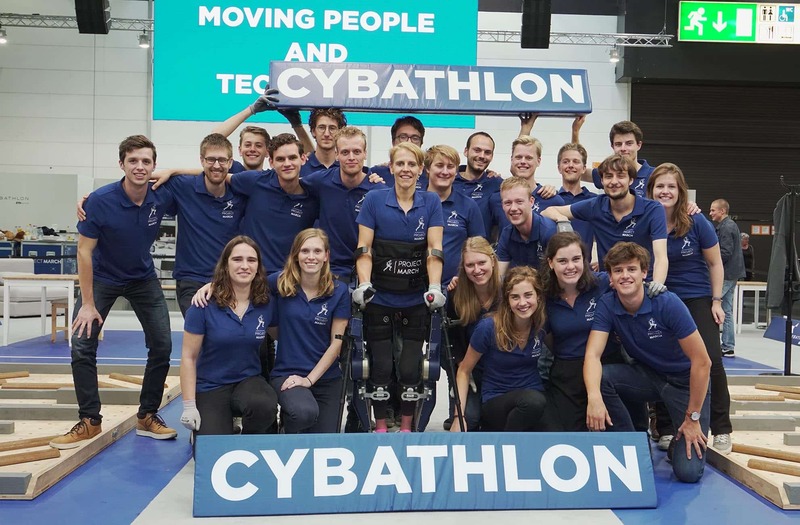 The Cybathlon is visited by commercial and academic teams, professors, media and other interested parties and a great opportunity for networking. Views expressed by contributing authors are their own and do not necessarily represent or reflect the views of the Exoskeleton Report.